By removing its historic memorials to George Washington and Robert E. Lee, Christ Church is yielding to the relentless logic of identity politics. To sit where George Washington sat is to keep his memory alive. So can only perfect men be honored? Can only the blameless be remembered? This list is by no means comprehensive, as calls for the removal of historical monuments have been rapidly cropping up all over the country. Thanks to jihadis, most ancient artifacts are almost certainly safer in the Smithsonian or the British Museum than they are in Baghdad or Mosul. A bargan-basement Nuremberg in Charlottesville, Virginia, is a warning about the attempt to create a permanent new racial conflict in American politics. The progressive impulse to purge public spaces of Confederate monuments isn’t about inclusion and tolerance, it’s about politics and power. 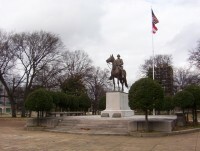 Perhaps the Memphis City Council, which wants to take down reminders of KKK founder Nathan Bedford Forrest, needs a reminder that people are complex.